Happy Friday! For as long as I can remember, I have always been a big birthday person. I enjoy doing the little things to make the birthday person feel extra special on their day. 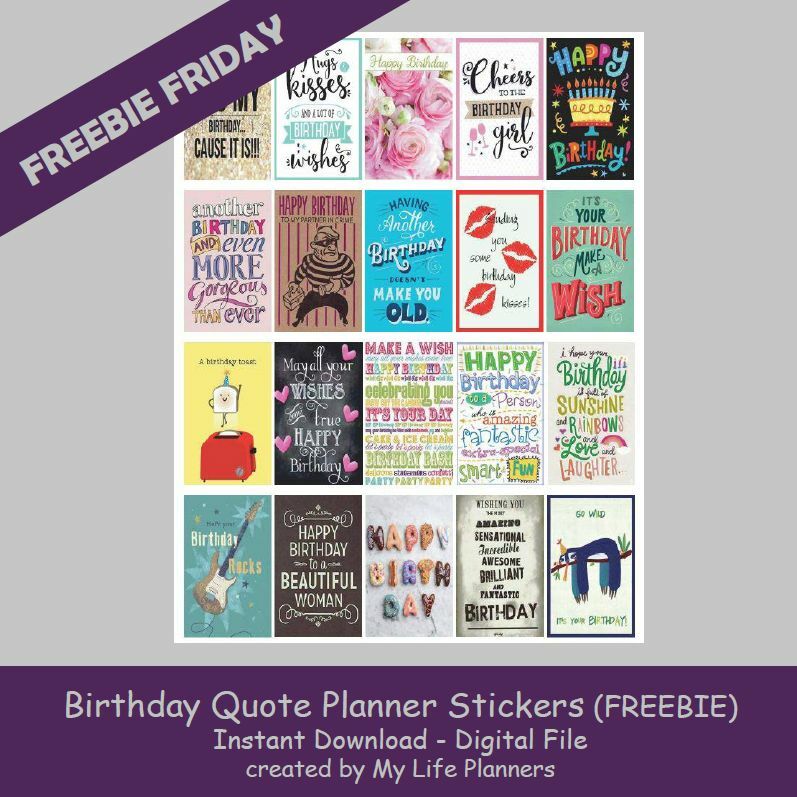 This Monday, August 7, 2017, My Life Planners will be celebrating one year of business and to honor that special birthday, I have decided to make this week’s feature for Freebie Friday all about Birthday Quotes. These stickers do not have to be used just for your planners. You can decorate birthday cards or even put a sticker on your birthday coworker’s desk to give them a smile. The only limitation is your own creativity and the possibilities are endless. The stickers will fit most planners but are the standard size of EC at 1.5” x 1.9” and HP at 1.5” x 2.25”. To download the Erin Condren sized stickers. Please click here. To download the Happy Planner sized stickers. Please click here. Make sure that you have a PDF reader. You can download the Adobe Reader free from here. When you are ready to print, open the file with your PDF reader. To print select Letter Size (8.5 x 11) and make sure to select “without a border” and “Actual Size” otherwise your stickers will not be printed in their correct size. NOTE: Happy Planner stickers will fit Mini planners if they are reduced in size 59-60% before printing. You will want to print the stickers out on a 8.5 x 11 full size sticker paper. I use Avery Sticker Project Paper. If you like you can print these out on a regular card stock paper and use double sided tape to attach to your planner. Cut the stickers out with a straight edge cutter or a pair of scissors. Print as many as you need. Colors may vary depending on your screen resolution. All freebies are for personal use only and are not to be resold. Have a good week and enjoy the Freebie Fridays.